Thankfully, The Desolation of Smaug is an improvement on last year’s opening to the Hobbit trilogy. 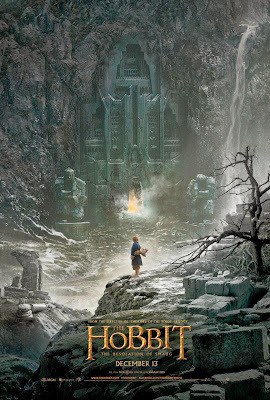 It’s the next instalment in the quest of the fiercely loyal Thorin Oakenshield and his band of bumbling, clumsy dwarves (who frustratingly proceed to get haplessly captured every step of the way) to reclaim their treasure from the dragon Smaug, aided by Bilbo the titular hobbit. An Unexpected Journey was disappointing as it quickly became clear that this trilogy is not a retelling of Tolkien’s story, but Jackson weaving his own tale with his Lord of the Rings films. At least this time around we know what to expect, softening the blow. So what’s new in this film? As well as Bilbo and the dwarves, we witness Gandalf uncovering the seeds of the Lord of the Rings plot, and a goblin horde in pursuit of the dwarves. As such, Jackson has developed the film into a multi-stranded and expertly edited narrative that diverges from the book whilst filling in the blanks. Undoubtedly it will all come together in the final film of what has become a hugely and unnecessarily long-winded tale. Legolas (Orlando Bloom) and Tauriel (Evangeline Lilly) have also been included (despite not appearing in the book), purely to shoe-horn in a forced and awkward love triangle with Kili the dwarf that concludes in laughable fashion. It is yet another flimsy link to Jackson’s previous trilogy, though the addition of Lilly does provide some femininity amongst the otherwise gruff display of grunting machismo the rest of the cast offer. At least we get to see a darker side to Bloom’s character, even if his acting ability hasn’t improved. The film does have its moments of darkness, particularly with the terrific set-pieces. Arachnophobes will be cowering during the forest scenes and shuddering from the hideous sound effects, whilst Lee Pace revels in graceful spite in his performance as the elven king Thranduil. Gandalf’s plotline (thankfully containing little of Radagast The Brown – the Jar Jar Binks of the trilogy) culminates in a striking CGI sequence of pure hellish evil – one of the best moments since Fellowship’s Balrog battle. For the most part though, Jackson wrestles between fantastical prophecies and fairytale humour with a tone that jarringly shifts from one to the next. The script is overflowing with silly one-liners; the dwarves are little more than two-dimensional jokes; and Stephen Fry is horribly miscast as the Master of Laketown. And whilst the fighting is tense and often balletically choreographed, there remains moments of absurdity – the barrel sequence in particular. Of course, the art design is impeccable and New Zealand is beautifully shot, creating a true sense of a convincing world. Yet after five films in this universe we’ve come to expect this from Jackson – with the bar already so high, he fails to offer any wow moments. The same can be said of the score which relies too heavily on previous themes – Ed Sheeran’s song over the credits is the only musical surprise. And then there’s Smaug. Voiced by Benedict Cumberbatch in a deliciously malevolent turn, his CGI design is wonderful and his scenes with Martin Freeman’s Bilbo are electric. In short, this is the best computer-generated character since Gollum. For anyone wondering how there can still be another film to go, rest assured The Desolation of Smaug ends on a ridiculous cliff-hanger. Of course, we’ll all be rushing to see the final outcome, but after two films it’s clear that with The Hobbit Jackson has failed to recapture the magic of The Lord of the Rings.